Here’s a quick little card to just say “hello”. The stamp is another great one from Unity Stamp Company called Hello Daisy. I love the simplicity of this stamp and the tiny heart in the center is just so cute! I stamped the daisy with brown ink on white card stock. I colored it with Copic markers and punched it with a scalloped oval punch. I layered the stamped image to a larger scalloped oval punched from green card stock. To make the card, add a piece of crocheted lace ribbon to a panel of golden patterned paper. Attach a 4- inch paper doily over the ribbon, leaving about a half an inch overhang on the left side – trim this off. Tie a thin piece of twine around the ribbon. Attach panel to a white card. 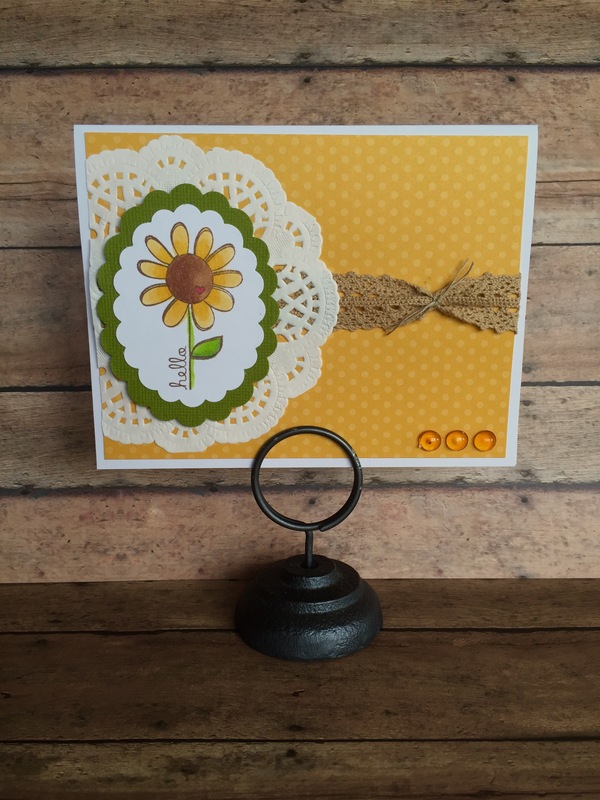 Then add the stamped daisy to the card with foam tape. To finish it off, add 3 dew drops (or 3 tiny buttons) to the bottom right corner. This card comes together very quickly. It’s a great any occasion card. It would work perfectly with any color scheme, too.